Snip excess leads and straighten the coil with the included screwdriver. Pre-fire the coil a few times. I usually start at a lower wattage and work my way up. 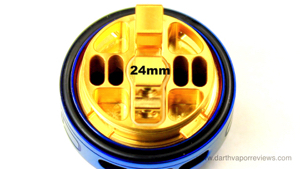 For the coils in this review, I started around 15w and went up to around 25w. This allows for hot spots to be scraped out using tweezers and it brings out nice colors in the coils. 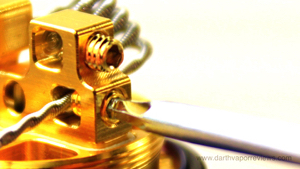 You want your coils to heat up from the inside first moving to the outside. * Very smooth thread machining. * Two styles of glass tubes. 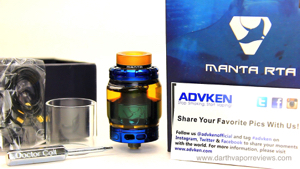 The Advken Manta RTA kit comes in a thick, cardboard box. 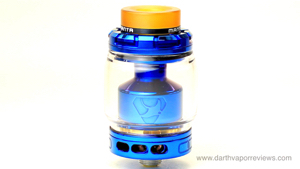 Inside the box the kit contents include: a microfiber polish cloth, a spare 3 milliliter straight, Pyrex glass tube, a spare parts bag with extra post screws and O-rings, a Doctor Coil screwdriver and the Manta RTA with 5 milliliter pre-installed Chubby glass tube. The Manta is made of stainless steel. 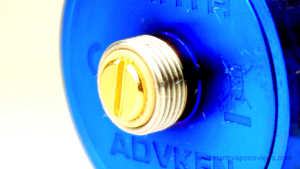 It is 510 threaded with a Gold plated connection pin and it features a removable wide-bore 810 Manta drip tip. 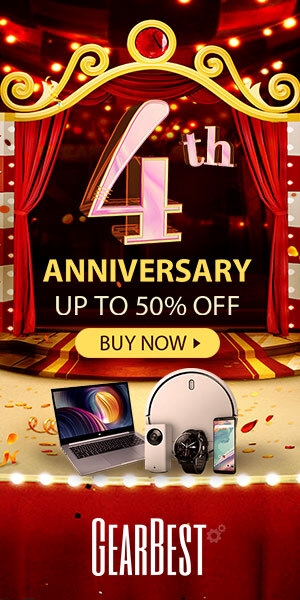 It can be disassembled into five main parts for cleaning. 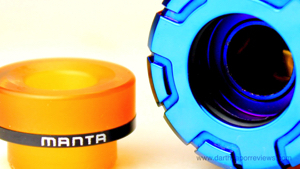 It has a three-hole airflow ring with the potential for six open holes. The deck has four Gold plated staggered dual-curved posts. The diameter is 24 millimeters. The deck has large air holes and four juice wells. For todays build I'll be using some Mad Rabbit 0.45 ohm twisted fused Clapton coils and some Cotton Bacon Bits by Wick N Vape. Start by loosening the post screws. Add your coils and tighten the screws. If the outside is heating up first like the coil in this video, then scrape it a few times to work out the hot spots. 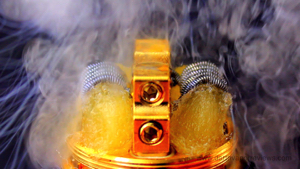 Once your coils are ready, wick them with some organic cotton. Cut the ends just long enough to fit down into the juice wells. Starting at the bottom of the cotton, tuck the wicks into their wells. Prime your coils with e-liquid. Screw the glass tube and tank onto the bottom deck. 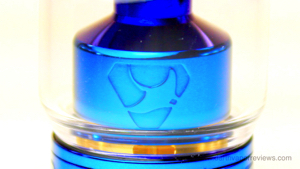 The top of the tank has two large e-liquid fill slots. 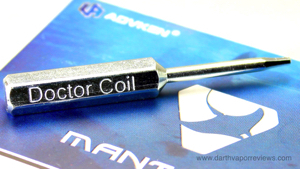 If you would like to pick up the Advken Manta starter kit for yourself, just click on the links or the logo below. Have an excellent day and may the Vape be with you. 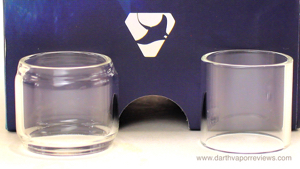 I also think it's pretty cool that they included two Pyrex glass style tubes with this kit. The machining on the threads is incredibly smooth. I really didn't find any cons with this RTA except one and I'll jump on the bandwagon with this one. 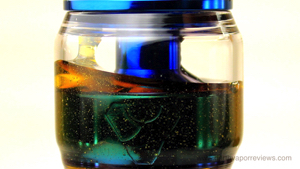 Please quit making tar stained colored drip tips. They are not very appealing. Other than that, I really like this RTA. It's easy to build, looks classy and vapes great. Fill the tank with e-liquid. If using the straight glass tube you can get around 3 milliliters of e-liquid and with the chubby tank, you can get around 5 milliliters. Once full, replace the top cap. Attach to your favorite device and you're ready to vape. I'm a fan of RTA's and this is a great one. I know some vapers don't like the chubby style glass tubes, but I like that they hold more e-liquid. 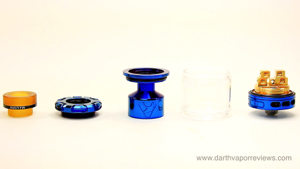 * Tar colored drip tip.